has a special breed of Bloody Marys for eye openers and sure to kill the dog that bit ya! The “Texas Thunder Saloon”, we have ICE COLD BEER at a fun "Full Service Bar , with Happy Hour every day 11am - 5pm, “Karaoke” "Live Music', ”Outdoor concerts, Covered Bike parking in July! The new management group have put together the Hottest-coolest venue in the whole city! The Texas Thunder Saloon is quickly becoming the 'Ultimate Cruise Bar:"Kick stands up, Hot Rod,s rumblin it's time to head over to the Texas Thunder Saloon! A bar built for everyone! Take a short scenic drive on the back road from 45 through Fm 1488 and you’ll end up at Hegar Road & FM 1488. NO traffic, NO semis,NO crazy Houston drivers. on the path where all motor heads end up! The Management Group reached out to several old friends just to kick things off with a little style. they will point you to the Texas Thunder Saloon. 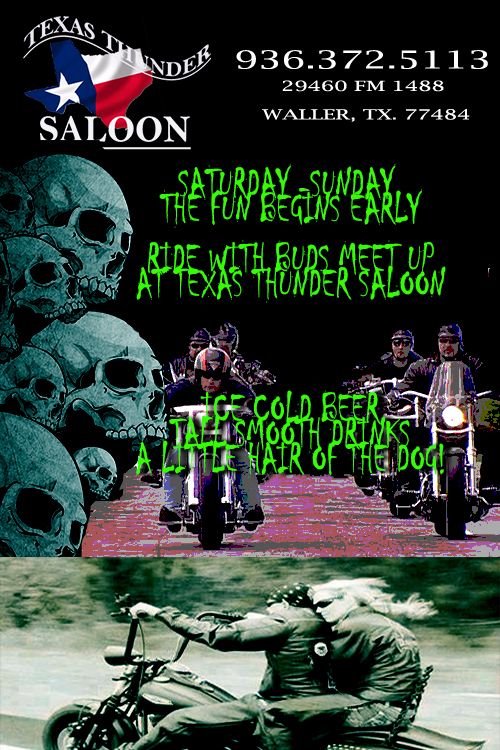 Texas Thunder Saloon Sunday Funday, Sports-Food-Bloody Marys - kill the dog that bit ya! Speed Dating in Houston | Friday Night | Singles Events | As Seen on VH1! Speed Dating in Houston | Friday Night Singles Event | As Seen on NBC! Singles Event in Houston | Friday Night Speed Dating | Seen on NBC!